a book chick: "The Things They Carried"
my take: Written in pseudo-memoir style, this novel reads like a collection of short stories, and after listening to the author in a recent community event, it reads like rumination and ramblings in the brain of the war vet. These things - what they see in the field - never go away. These are the things the living carried away from Vietnam. What they carried into and around Vietnam was a fascinating array of objects and thoughts that became their identity - their identifying features in a situation that sought to take away their being. 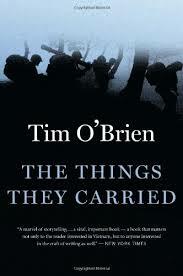 Mr. O'Brien in his Big Read Holland lecture made clear that he was not trying to make political statements in the telling of these tales (bits and pieces of his experience in Vietnam that are tucked and woven into the characters in Things) but to heal himself. He gave instances where these stories brought healing to other vets, as well.